ReInvent The Wheel is splitting into two projects: MBZ Parts, and MBZ Diesels. MBZ Parts is your one-stop source for restoration parts for your Classic Mercedes-Benz. Select your chassis below to browse, or search for your part and model above. If you don't find what you're looking for, please contact us. 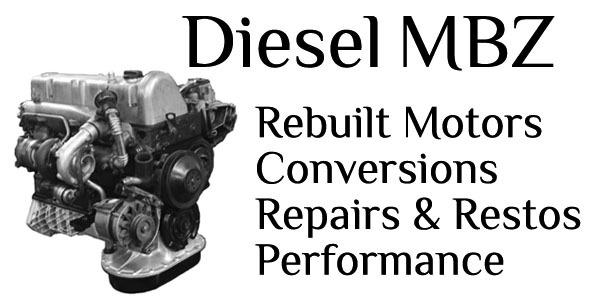 We have thousands of used, rebuilt and new parts not yet listed in our online catalog..
Diesel MBZ is your premier specialist in Mercedes diesel engines, with a particular focus on the renowned OM617 Turbo-Diesel motor. Whether you're looking for a high-quality rebuilt diesel motor as a replacement swap for your Mercedes, or you want to do a turbo conversion in your G-Wagen or other 4x4 vehicle, we've got you covered. We've even got performance upgrades. We're also a full-service shop and can cover nearly any repair or maintenance job you throw our way, including complete and partial restorations for your beloved Classic Mercedes.